I just cleaned out our medicine and bandage supplies. I have to do that every once in a while to get rid of everything that has expired. I really thought I had done a through cleaning recently, but based on how many medicines we had that had expired, I guess it was longer ago than I thought. It was funny going through everything and wondering “Why do we have that?? ?” And then remembering…. There was the box of very large band aids. That was for the time, not too long after we moved into this house, that Hubby and Youngest Daughter decided to go walking in the hills near our new home. One of Youngest’s feet slid on the gravel and she went down, scraping the entire front of one shin. I happened to go outside and look up the street just as they were coming home and I could see the blood running down her leg. The only thing that kept me from screaming or crying or something eqyally dramatic was the fact that Youngest was on her feet and walking. Obviously it couldn’t be too bad if she was walking. We needed LOTS of those big band aids to cover that boo boo! She got to go off to college with a big red scar all down the front of her leg. I am happy to report that it has faded now, just in time for college graduation, but not the memory! There was also an amazing amount of Musinex hiding in the cupboard. I really dislike the name of that medicine, but it does work when you need something like that. That was from the ILLNESS of 2013. I put that in capitals because lower case letters just don’t do it justice. I was off work most of a week and finally went to the doctor when Youngest commented, when I was talking to her on the phone, that I seemed very ill. You may remember, I started a post on this blog with the words “I am dying” during that unpleasant time. I had to take some steroids to calm the whole mess down before I started getting better. I was happy to throw out all the expired Musinex and, hopefully, the memories of that horrible ILLNESS. The pack of ginger gum for motion sickness comes with happier memories. I bought that to take on our northern European cruise in 2013. Happily, I never needed a single piece of it because it was smooth sailing all the way. Don’t forget to clean out your medicine and bandage supplies every onece in a while. Then you, too, can take an injury and illness walk down memory lane! Maybe you grew up in a mansion where servants brought you anything you wanted and your life lacked for nothing. I didn’t. We were pretty typically middle class although it fluctuated from lower to upper depending on the economy. My parents were very sociable people (I call my mother “Nell the Party Thrower”) and since I was a late in life child by 1960s standards (mom was 34 when she had me and that was really old back then) I went everywhere with them. I got to see how other people lived and many of them had more money than we did. In many of their bathrooms was a dispenser with the little paper Dixie cups. We never had those ! They were the height of extravagance and luxury to me – a little paper cup that you could use once and throw away! That seemed so much better than the toothpaste and hard water encrusted cup I used when I brushed my teeth! Fast forward and for many years now my house has been supplied with a little Dixie cup holder in each bathroom. 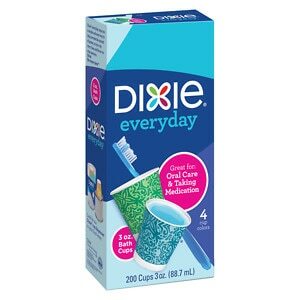 I love my little Dixie cups! I am curious, what little thing did you never have as a child that you make sure to have now? Is it canned apricots? Name brand paper towels? I was just minding my own business last night, watching an episode of CSI New York from the TiVo with my Hubby when Eldest Daughter came home, plopped down, and opened up her lap top (of course). Then, out of the blue, she informed us that we are living in a really bad spot when the zombie apocalypse hits. I paused CSI New York and asked how she knew this. It seems she was looking our home up on a web site called “Map of the Dead:Zombie Survival Map.” (mapofthendead.com) Well, of course she was! To think, I woke up this morning thinking I live in Southern California but now I knew I actually live in a place where the undead are gong to have a field day when they decide to take over the world! Kids-you gotta love ‘em! I checked out the map and sure enough, I live in a pink area, which means it is highly populated and thus just where the zombies want to be. By the way, the web site appears to have something to do with a multiplayer game having to do with ….zombies! I decided to put this warm and fuzzy family moment into the “things I didn’t expect when I had kids column.” There are lots of things in that column. If I have a bad dream tonight I know who to blame! So, did your family happen to have a casual conversation last night about a zombie apocalypse? Yeah, I didn’t think so.